Located less than a mile from the green way and the Vélo Francette cycle route (from Ouistreham to La Rochelle). We extend a very special welcome to cyclists. 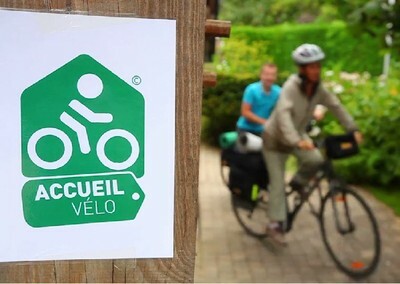 ‘Accueil Vélo’ is a national label that guarantees a quality welcome and suitable services for cyclists travelling along France’s many cycle routes. Empty pitch for a small tent with or without electricity. Provision of an ‘Accueil Vélo’ chalet (with refrigerator, table, chairs and an electric socket to recharge your mobile). Printed material on cycle routes.